The US is not in recession now and is not going into one in 2008. *** I’m simply using the indices’ relations to their 200, 50 and 10-day moving averages to tell me the long, intermediate and short-term trends, respectively. The DJIA is up 9.5% from its mid-August low. The DJIA was up 1.2% for the week, its fourth straight weekly gain. The DJIA reached a new record close of 14087.55 on Monday. The DJIA hit a new intraday high of 14124.54 on Friday. The S&P 500 closed at a record high on Friday. Markets hit record highs last week as investors hope the worst is over. 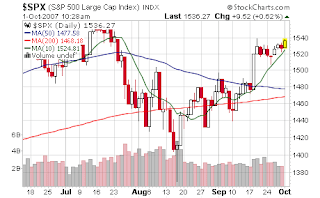 A positive employment report drove the market higher on Friday. The market continues its bullish trend. The Dow continues to lead the way as investors are favoring large multi-national businesses. NOTE: I’m simply using the indices’ relations to their 200, 50 and 10-day moving averages to tell me the long, intermediate and short-term trends, respectively. The Fed helped stocks with a .50% rate cut in September. Since then, stocks have clearly been trending up. How will Q4 unfold? I only wish I knew! However, at the moment the market is clearly in a bullish trend and this market is favoring the large cap blue chip stocks. The DJIA is only 0.7% below its record close of 14000.41 set on July 19th. This should be an interesting week as we watch and see if the DJIA will break through and hold above the 14000 level. U.S. stocks rallied, sending the Dow Jones Industrial Average to a record, as investors speculated the worst may be over for banks and construction companies hurt by subprime mortgage losses. The Dow’s record caps a six-week recovery from a slump that helped wipe out almost $2 trillion in U.S. market value. The 30- stock gauge added 191.92, or 1.4 percent, to 14,087.55, above its previous closing high of 14,000.41 set on July 19. The Standard & Poor’s 500 Index increased 20.29, or 1.3 percent, to 1,547.04, 0.4 percent shy of a record. The Nasdaq Composite Index gained 39.49, or 1.5 percent, to 2,740.99, the highest in six years. David Gaffen @ MarketBeat: It’s often helpful, in times like this, to look at what speculators are doing, as extreme positions taken by maddened crowds generally serve as nice indicators of exactly what not to do, and with that, there’s a bit of contradictory evidence at this moment. Small traders, which normally includes retail investors, turned bearish this past week, going short S&P 500 futures by about 25,000 contracts, for the first time since March 20. Schaeffer’s Investment Research analysts note that small traders turning bearish has proven to be a bullish signal, with average returns of 3.5% in the S&P 500 for the next 20 trading days. Go back 4 to 6 weeks ago… If you were listening to the media you would have thought we were months or years away from new highs in the stock market. What happened to all of the concerns related to the housing market, the slowdown in consumer spending, and reduced corporate spending? I guess the market just doesn’t care about all the doom and gloom predictions in the financial media. What is the action of the market telling us? When in doubt, follow the trend! In spite of the negative news (dollar reaches new low, housing situation, oil at new highs, etc.) the market keeps climbing. In his latest newsletter John Mauldin looks at whether it is possible for the US economy to be in a recesion while the US stock market continues to rise. John’s letter points out that the market’s rise this year has been dominated by the more global sectors which consist of the large multi-national businesses. Many of these companies make more than 50% of their earnings outside the US and the global economy is doing well. This provides some insight into why the market continues to rise in the midst of so much negative news. Jim Cramer provides a simple explanation of the subprime-lending crisis in New York Magazine. Check out Mr. Cramer’s article, Bloody and Bloodier, to read why he thinks the subprime-lending crisis is worse than you think, and could crush financial and real-estate markets for years.